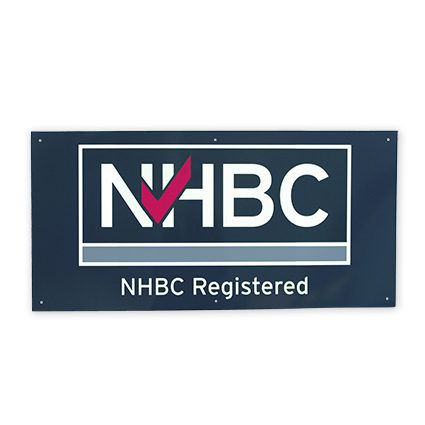 Position this smart, durable pre-drilled NHBC registered builder site board near your site entrance for maximum impact. Measuring 122cm x 60cm, the board will show that you have demonstrated sufficient financial security and technical competence to be admitted onto the NHBC Register. NHBC carries out commercial and technical assessments of all applicant builders and developers before offering ‘registered’ status. All registered builders agree to comply with the NHBC Rules and build homes to the NHBC Standards of construction.